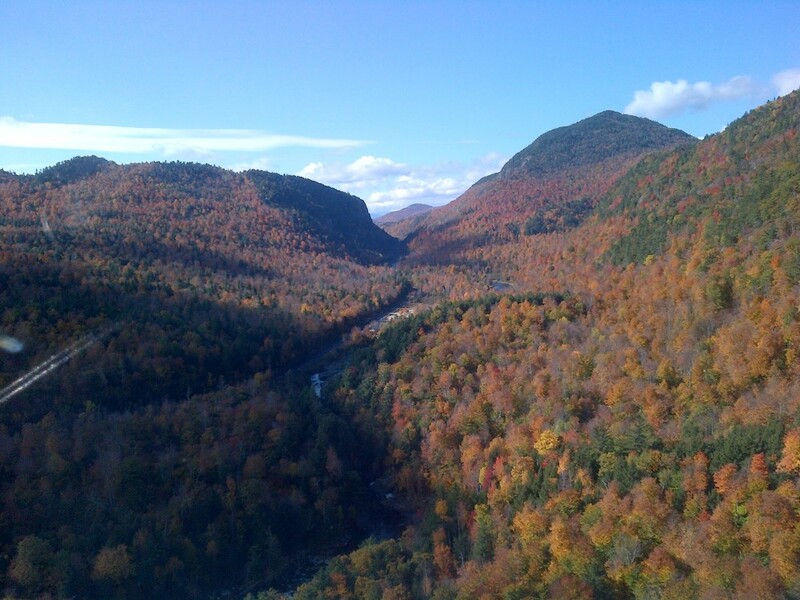 The West Branch of the AuSable River is mostly freestone, flowing out of the High Peaks of the Adirondacks. Two catch and release areas totaling 7.2 miles are open year-round to fishing when the weather cooperates. Our season really kicks into gear May through October. However, due to the cold winters up here, it is not likely to fish throughout the year. At best, it could give an angler a chance to extend the season later or start the season earlier. This, of course, is if and when the weather cooperates. The river has good access, most of the river flows through public land or has public access locations. Headwaters, South Meadow Brook and March Brook flow from Mount Marcy and merge to form the West Branch of the AuSable River. It's joined by several other small streams as it flows through meadows for a distance of about five miles. The water is slow to moderate in this section as it twist and turns through the meadows. Below the bridge at Route 86, the stream changes to a faster flowing river with some pocket water and a more typical pool, run, riffle configuration. The river gains even more strength below Wilmington Notch. There's a hundred foot high waterfall, appropriately named High Falls , in this section. The river finally settles down some with a series of pools with more moderate flowing water, but not for long. Yet another set of high waterfalls, the Flume Falls , exist farther downstream. It's about a mile below the Flume Falls before the river begins to settle down again but only because it is dammed farther downstream in Wilmington forming Lake Everest . This section is technically a lake but it's more like a wide, slow flowing river. Fly fishing the AuSable River in this section can be good. Some of the river is shallow with a silt bottom, however, there are spots that get deep. Often trolling a streamer has good results or when there is a hatch going on the top water action produces well. 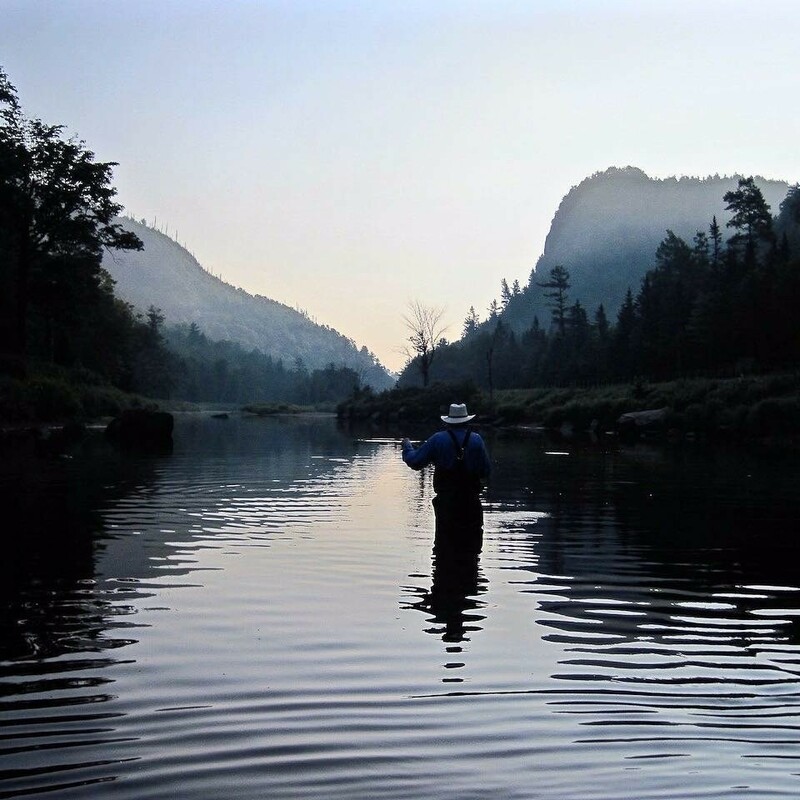 The water below Everest dam provides some of the best fly fishing waters the West Branch of the AuSable has to offer. It's more freestone stream. The river falls at a moderately steep decline. There are large boulders and plenty of prime pocket water. Fly fishing the AuSable River in this section isn't so easy though. There is a section of the river about two miles long that lies below the Lewis Bridge just downstream of Wilmington that cannot be accessed for fishing due to posted private land. Below Black Brook, a small tributary stream, the fishing is usually very good. A mile or so down stream of Little Black Brook the river is posted on the right side, as you go down river, and is enforced by the land owner. It is accessed by a trail head with a distance of 1 ¼ mile hike to the State land access along the left side of the river facing downstream. The trail head is marked by a small sign on Haselton Road in the town of Black Brook. Look for it about 1 ¼ mile past the small bridge that crosses Black Brook up the road on the right. There is some parking on the left side of the road adjacent to the trail head. Also below the paper mill dam there is a decent tail water section about a mile plus long. Just below the short section of tail water, the river converges with the East Branch to form the Main Branch of the AuSable River. Our season really kicks into gear more mid May and fishes well into October. Some times the weather is warmer in April and the fishing can turn on for some notable early spring action. The river access is great due to the fact it flows is mostly on state land and there are roads along the upper reaches. There is a mixture of water types including lots of pocket water, deep pools, and long slow water runs. With its abundant hatches, quality numbers of fish definitely make this a great destination for those interested in fishing a productive stream in a beautiful setting. The West Branch of the AuSable River is located in the Adirondack Mountains in the Northeastern part of the state of New York. 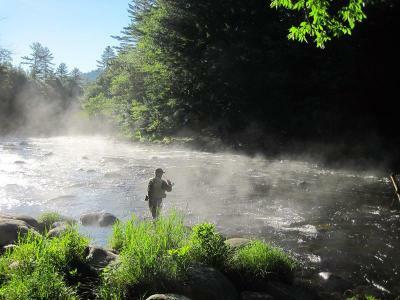 This is one of the best trout streams in the entire Eastern United States. There are plenty of anglers that will argue that it's the best stream in New York. It has some very nice trout that range from ten to seventeen inches and a few even better. There's one thing for sure. It's one of the most beautiful streams in the East. We should mention that there's a Special Regulations "catch and release" artificial flies or lures only area from the mouth of Holcomb Pond Outlet on Riverside Drive downstream to a marked boundary just over two miles downstream of Monument Falls on Route 86, and from the bridge at Whiteface Mountain downstream to the bridge that crosses route 86 just above the Flume pool next to R.F McDougall’s Pub. See the Public Fishing Rights Map / West Branch AuSable River for areas of special access.